Well, that just leaves it wide open, doesn’t it? Strangely, I didn’t panic, but it did sort of freeze me in my tracks for a bit. But when I got over the initial shock of having to take on such a daunting project, I pulled it together, and I have begun. I’m gonna walk you through the steps I’m taking, and you can join me on this journey of mine, as I make a special wedding quilt . . . Step 1: Come up with a plan . . . of sorts. Stare at the plan for a week or so, then change it a few times. Assume you have it finalized, and figure up what you’ll need to purchase to execute this plan. 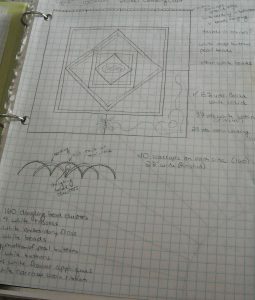 My plan is for the finished quilt to measure 100″ square. Step 2: Buy the supplies. But don’t get enough the first time, ’cause that would be too logical. Realize a little bit into the project that you only got about half of what you need. Make note to get more as soon as you’re able. I’m using Moda Bella White as my base fabric, both on the front and the back. I pre-washed it. I got 9 yards to start with, but I probably need twice that much! I also bought some white wedding satin to use for sashing, white satin cording and some dangly bead trim (which I have big ideas for, but may not be able to execute), lots of embroidery thread, some white satin ribbon, and beads. I have some more beads on order, and I’ll also be using some buttons. This quilt will probably weigh 75 pounds when I’m done! 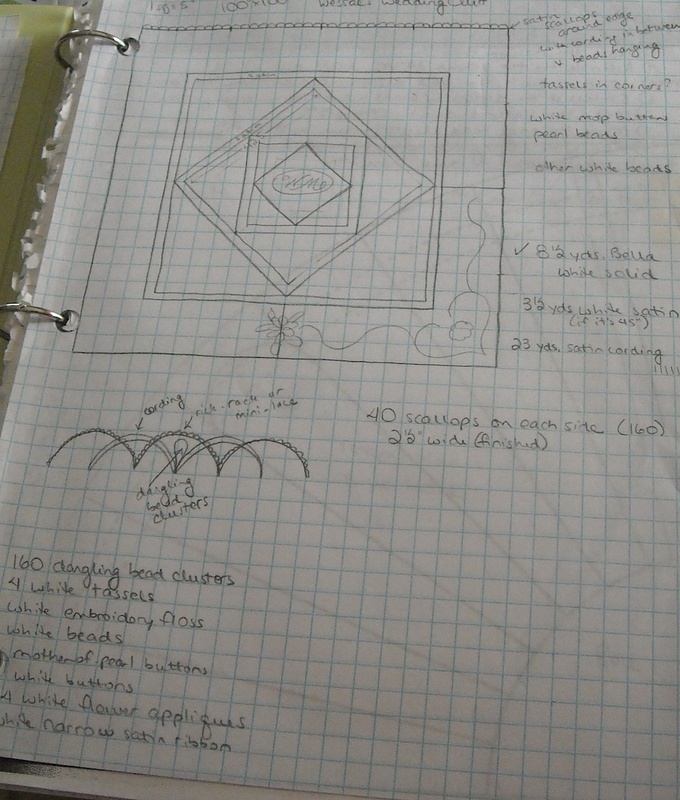 Step 4: Spend some time musing about how you’re actually going to accomplish a king-sized quilt, given the customer backlog you have for the longarm. I decided that since I can’t tie up the longarm machine long enough to quilt the entire thing at once, I’ll do it in sections. 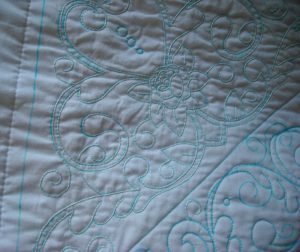 Each section by itself will take a minimum of time on the longarm, leaving it free for “real work”, and then I can do the hand sewing part of the wedding quilt of an evening when it’s time to sit down after a long day. The only trick to that will be not falling asleep in my chair, needle in hand! 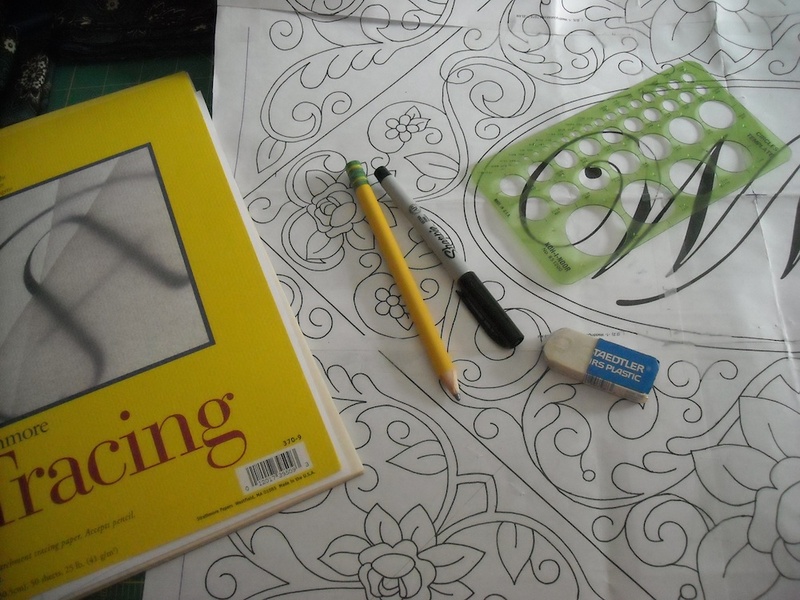 Step 5: Begin drawing the design for the quilt. I started with the middle section. I did their initials on the computer, then put that in the center, drew the section edges around it, then filled them in with my design of choice. While just this center section took me 6 hours to draw and get ready to transfer to the fabric, it’s not as difficult as it appears. It’s symmetrical, so I only had to draw half of each design, then flip it and trace it to complete it. I did that part in pencil, then when I had it the way I wanted it, I went over my lines with a sharpie pen so they would show up to be traced. 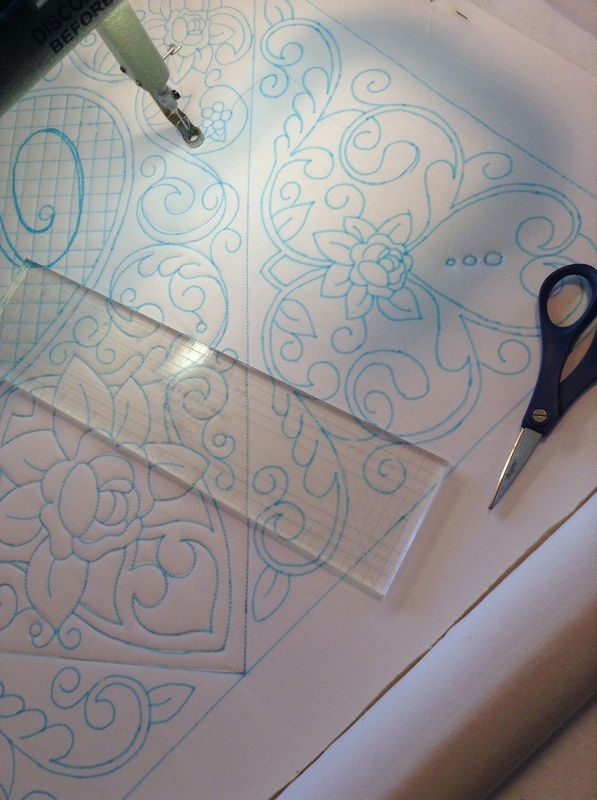 Step 6: Trace the design onto the fabric, after cutting it a bit larger than the finished section size will be. The center portion is only 25″ square, so I cut a 30″ x WOF piece for the front, and the same size piece for the backing. I loaded the backing on the longarm, then put the batting on. 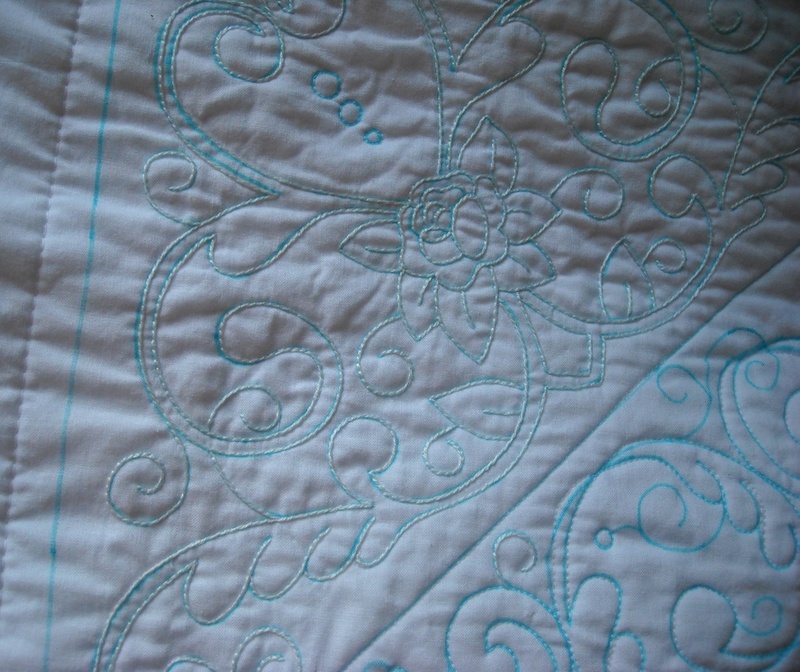 I’m using Quilter’s Dream Poly Select. 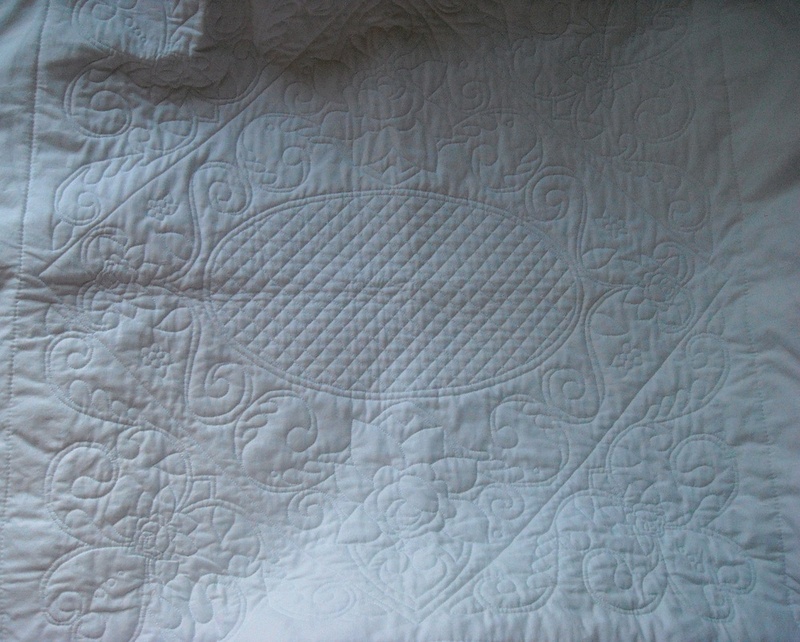 It’s the perfect loft for this project, and it’s nice and white, so it won’t “yellow the quilt down” any. To trace the design, I used blue washout marking pens. I pressed the top, then traced the design carefully, trying not to put any wrinkles back into the piece, then loaded it on the frame. I didn’t want to press it after marking, because heat sets those blue marks, and I need them to come out when I’m finished. Step 7: Machine quilt the part to be machine quilted. It may seem like I’m going about this all backwards, but I want the quilt to look a certain way on the back, and a certain way on the front. I want lots of embroidery on the front, but I don’t want to have to quilt next to the embroidery, or quilt over the embroidery, so I figured the best way to do it, is to add the embroidery after the machine quilting part is done. Step 8: Begin the hand embroidery portion of the center section. I’m embroidering the design on the front, right over the top of my machine quilting lines, and adding in some extra swirls and filler stitches in certain places. This part is very slow going. 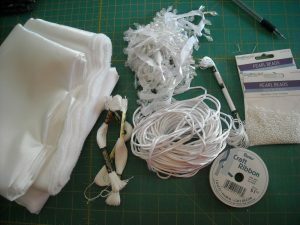 I’m using 3 strands of DMC white embroidery floss. It took one entire skein just to do one corner of this design, so I may have to go purchase some more thread! In lieu of taking knitting to my knitting group meeting this past week, I opted to take this along and make some progress on it, since time is short. My friend, Darlene, asked me a couple questions, then as I was elaborating on the process, she said, “Girl, you better shut up and sew! You’ve got a lot of stitching to do there!” So so funny — and so true! And now, whenever I’m working on it, her words ring in my ears — “just shut up and sew — you have a long way to go yet!” Haha! When I’m done with all the embroidery, I’ll soak this section to get the blue lines out, then add some other embellishments. I have buttons, beads, ribbon, and other things to add to it yet. Next up will be drawing the rest of the designs that go in the various sections, buying more fabric, tracing, quilting, embroidery, and so on . . . I think the end of August is going to get here before the end of this project! 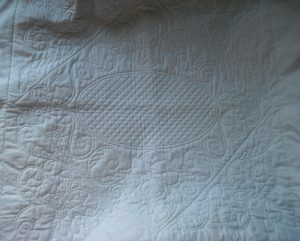 Be sure to check back in later, and you can join me as I continue the saga of The Wedding Quilt. Ok I think I started holding my breath part way through reading this post. My mouth fell open at some point, my eyes glazed over and I started blinking unexplainedly. You are a far better woman than I! Good luck in finishing your masterpiece n time. Oh my goodness! I have to see this when you’re done. Take many pictures. Maybe she will let you bring it to quilt camp next spring. Good thing you did that revamp of the wedding dress that went to Houston and was then sold years ago. I think you used a similar process for it. I have watched you do all of this before. I can’t use the word hand-hold you through. I can’t stand to get that close to an Angel in the throes of Creation. Read the Bible stories of encounters with angels to see what I mean. Goodness! It sounds and looks fabulous already. Good thing one has a year after the wedding to give gifts and be on time. Because it’s so elaborate, I know you love your daughter very much. I have seem the center block. I is amazing and unbelievable all in the same sentence. I am looking forward to seeing it before it goes to CA. Shelly is amazing with her ideas and finished work! They are allowed to only have white dogs. GORGEOUS! 🙂 Congratulations to your family! Oh my word! Wow! Do you sleep? Honey you are excellent at what you do. I am so impressed. Can I send you a quilt to do on the long arm? I am making a special quilt for my daughter. I really want it done right. It is a king. ??? ?And how much. That’s important. Wow! Sew glad it’s not me! I know it will be spectacular! I hope I get to see it before it goes out west. all I can say is WOW…you do such fantastic work Shelly. Thanks for sharing.